This continuing education course presents the science and application of high-intensity intervals to incinerate fat, shape and strengthen the lower and upper body, and build core strength. 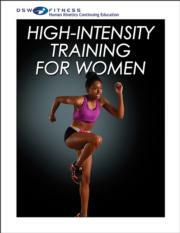 The High-Intensity Training for Women CE Course is one of few continuing education courses that houses a collection of science-based HIIT protocols in one place and addresses the training needs and goals of women who want results and progressively more challenging workouts. You will learn how and why HIIT works, how to set up a HIIT workout, and the rationale behind recommended ratios of rest and recovery. Dozens of exercises and 19 complete workouts provide an exercise experience that incinerates fat, shapes and strengthens the lower and upper body, and builds core strength. Variations for exercises as well as ways to incorporate tools and toys such as kettlebells, resistance bands, sliding discs, and trampoline ensure that your clients will benefit from customized workouts that address their needs and help them reach their fitness goals. The course includes access to an online video library of more than 30 clips that demonstrate key dynamic exercises from the book The HIIT Advantage: High-Intensity Workouts for Women and videos of exercise demonstrations that show how to put these exercises together for maximum results. The 30-minute streaming video offers a complete, ready-made workout to illustrate proper technique and program design. The study guide contains a course syllabus, chapter objectives, and end-of-chapter learning activities to prepare you for the 50-question continuing education exam at the conclusion of the course. Irene Lewis-McCormick, MS, is a personal trainer, international presenter, author, and 30-year fitness veteran. She holds a master of science degree in exercise and sport science with an emphasis in physiology from Iowa State University. She is a certified strength and conditioning specialist with the National Strength and Conditioning Association and holds professional certifications from the Aerobics and Fitness Association of America, American College of Sports Medicine, American Council on Exercise, Aquatic Exercise Association, TRX, YogaFit, and many other organizations. Lewis-McCormick is the author of A Woman’s Guide to Muscle & Strength (Human Kinetics, 2012) and a presenter at SCW Fitness, ACSM Health & Fitness Summit, IDEA Health & Fitness, the Mayo Clinic, and many other regional venues. She is a TRX suspension training master course trainer, a Tabata Bootcamp master trainer, an instructor for Barre Above and Xercise Lab, and a master instructor for JumpSport Fitness. She has been a featured presenter in several DVDs, including programs for pre- and postnatal exercise, water fitness, strength training, small-group training, circuit training, Pilates, and foam roller exercise. Lewis-McCormick is a contributor to consumer and fitness publications, including Shape, More, IDEA Health & Fitness Journal, Prevention, Fitness Management, Diabetic Living, Diet, and Heart Healthy Living. She is on the editorial advisory board of Diabetic Living magazine and is a subject matter expert and exam writer for the American Council on Exercise.